The US will gift Pakistan a billion dollars’ worth of drones as part of an annual 3 billion dollar military aid package. What? This is state of the art stealth warfare and spying technology. Not even our true allies in the Western alliances have it. Why would we give it to an “ally” that consistently demands more and more and does less and less when it comes to fighting terrorism? The Pakistani spy agency, the ISI, who will surely share the technology with its great ally China, has already been decisively implicated in playing a double game – aiding terrorist groups, such as Jaish-e-Mohammed, while pretending to help us fight the Al Qaeda terrorists and the Taliban. They have shown no accountability on the billions we give them and, in fact, are known to have diverted our aid in increasing their nuclear warheads in the last few years. Pakistan urges Afghanistan to drop the U. S. as an ally and join up with them and China to form a new security zone and world alliance. A majority in Pakistan now think that the U.S. is the biggest threat to their country. The Taliban boast that they have a waiting list of over 250,000 Pakistani and Afghani people waiting to commit jihad (suicide bombers) for their cause. The U.S. and India have definitely implicated Pakistan’s Spy/Military agency, the ISI, of masterminding and overseeing the Mumbai terrorist attacks. Pakistan has never delivered even one really important leader of Al Qaeda or the Taliban. In fact we are increasingly complaining of them shielding the big terror players. The truth is that in having Pakistan as our partner in fighting terrorism we are achieving the exact opposite – we are making ourselves more vulnerable to terrorism. Elements in the Pakistani government and ISI almost certainly share all our strategic warfare data with Al Qaeda and Taliban leaders. This is an unbelievable escalation of the arms race. Imagine what the drones can do in the hands of jihadi terrorists. It will not come as a surprise to anyone if the drones we gift Pakistan are used for aiding the Taliban anti-U.S. fighters in Af/Pak and for escalating the terrorist warfare against India. Also it will come as no surprise if China and other anti-West countries (N. Korea, Iran?) get to reverse engineer the technology resulting in a horrific escalation in the arms race. So I was thinking how we could possibly be doing this. Could it be that we are now unable to disentangle ourselves from the Pakistan experiment without admitting we made a big mistake? Maybe we just don’t have the moral courage to radically change our direction in fighting against perceived terrorism, which even the Pentagon now secretly acknowledges is the wrong strategic direction for us. See my previous post, Obama, Oh Bummer! Or is something diabolically clever that we are doing that no one has as yet a whiff of? Kill switches and other remote controls are on the minds of Western governments pondering whether to send weapons such as sophisticated anti-tank missiles, normally tightly policed, to allies. Chips can be designed to break down at a certain date. An innocent-looking component or even a bit of soldering can be a disguised antenna. When it receives the right radio signal, from, say, a mobile-phone network, aircraft or satellite, the device may blow up, shut down, or work differently. Very Clever Indeed! 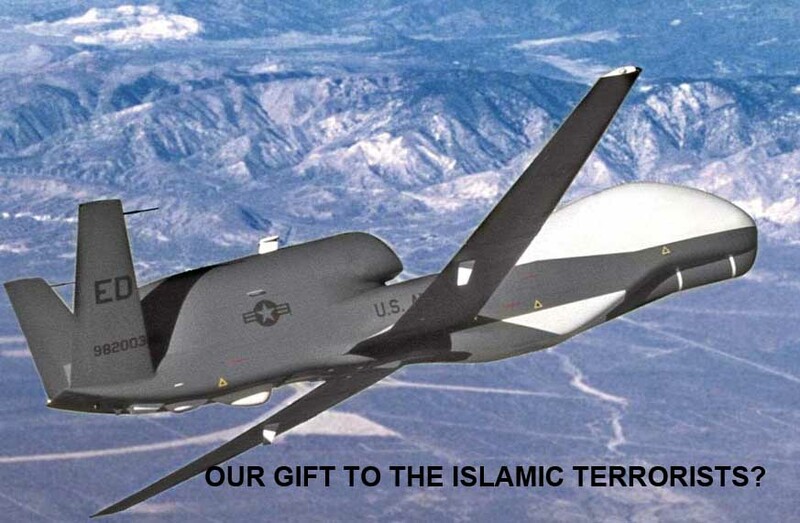 So maybe we’re going to gift Pakistan these drones but they’re really a Trojan horse. Maybe we have supersmart spy devices embedded in them that report everything they are doing and even a secret “kill” switch that we can use to explode them when they fall into the hands of Osama Bin Laden and he is taking a joy ride. Oh, I feel a lot better. We are ahead of these two-timing medievalist friends of ours after all. Whew!